Ahhh! 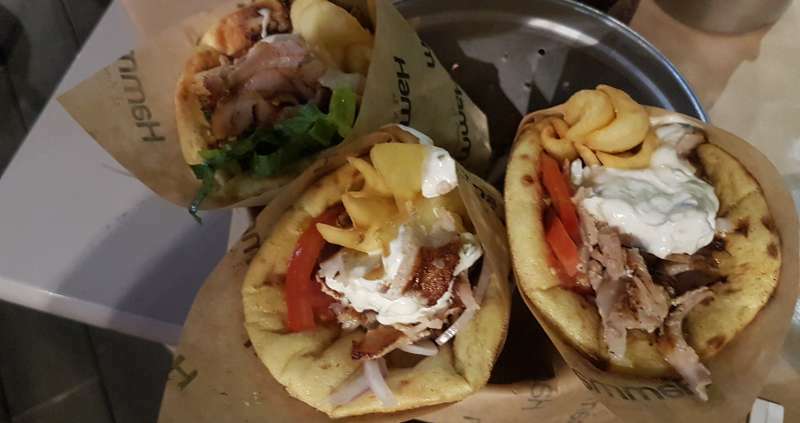 Real genuine Greek souvlaki – honestly, there’s nothing like it anywhere else, at least that I have ever found in Southern Ontario. And one of the best you’ll get is at a restaurant in Nea Filadelfeia, a suburb of Athens, Greece. It was my first evening back in Greece (since January – and my fourth trip in less than a year) and I was dying for some Hammam souvlaki, so off we went and enjoyed the rest of my first day in this beautiful country. It did not matter that I had been mostly awake for over 24 hours – for some reason jet lag flying east does not bother me as much as going west. Perhaps part of that is the excitement and adrenaline at arriving in Greece, and being with my partner after an extended time away. The trip was for a variety of reasons, including to spend time with my partner, try to do some business activities, and some concern over some possible medical issues moved the time frame up. I ended up staying for almost five weeks, and have some gorgeous photos – we did a lot of traveling to different parts of Greece, met some great people, and I enjoyed a variety of experiences. It will be impossible to describe the trip in one post, so this will hopefully be a series of several posts that include some of the great photos, some general observations, and a description of some of the activities. The first couple of days were spent catching up and getting settled in including creating a little office space in “spiti mas” – our house. Of course, lots of coffee was drank and I was treated to some wonderful Greek home cooking on my second day. Mostly, the second day was relaxing while recovering from jet lag and many hours of missed sleep. On the 18th of August though, and although I had spent some time in the Canadian sun before leaving, it was quite apparent that my pale Scot/Irish skin could use some Mediterranean sun and off to the beach we went. 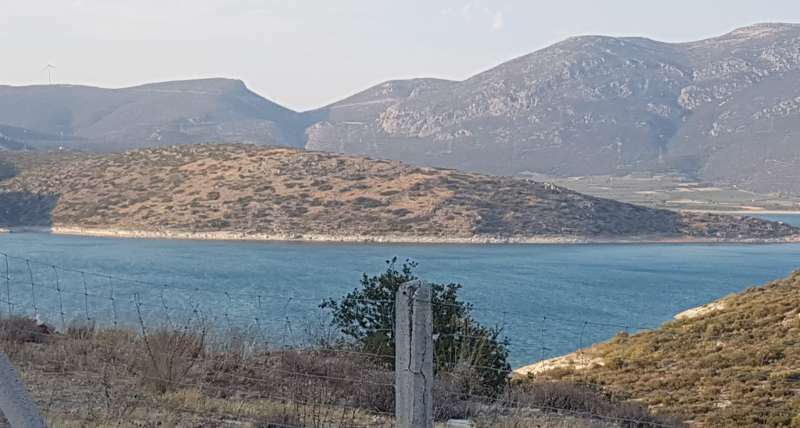 Normally, the traffic would have been quite heavy to drive to Artemida, a seaside town close to Athens – but it seems August is the “holiday month” for most Greeks, and there was little traffic. The beach at Artemida is locally known as “Loutsa Beach,” and while it is not considered one of the best, I found it to be wonderful, with sun beds provided and attendants close by to supply food like hamburgers, fried potatoes (like we call fries), iced cappuccinos, water and other beverages. The beach was sandy (which was hot on bare feet), and the water was pleasant, with quite shallow water for a good distance out from the shoreline. It seems to be a favourite place for families as the water is great for small children and there were certainly a lot of families enjoying the day. And my skin? Yes, I got a little burnt from being in the blazing sun for hours! Of course, we also enjoyed swims in the saltwater which was wonderful – my first time in the salt in many many years. I honestly also think that spending time in the saltwater has beneficial effects for the skin and body in general – far more than swimming or splashing around in freshwater. I noticed that a dermatology issue on my feet seemed to clear up considerably after that first day, and then later, completely the next time we went swimming in the salt. An interesting observation considering medicines prescribed by my doctor never really worked! It seems that no matter where we drive in Greece, there are always mountains to be seen, close by. Loutsa beach was no exception and being on the beach with such a beautiful view really made for a spectacular day for me. When the sun went down, we packed up and strolled a quiet path through a park like setting until we came across a pub with an outdoor area that was across the road from its main location. Unfortunately, I can’t remember the name of it, but we enjoyed a cold pleasant Greek lager with the brand name of EZA. As mentioned, the mountains in Greece can be seen everywhere and another common sight are all the outdoor eating and drinking areas of restaurants, “tavernas,” and pubs. Just about every establishment we visited had an outdoor eating area. When the weather suits, hardly no one sits inside. Some establishments have large decks outside, while others have tables on the sidewalk. And like the one we visited this night, some have tables on grassy areas and you’re sitting under trees in the fresh air. Another thing I noticed is that Greeks don’t have hangups about a lot of things that North Americans do. Although there are “No Smoking” signs, smoking is absolutely permitted, especially outdoors and even establishment owners will accommodate smokers inside, as long as no one complains! Children accompanied by parents (at least I assume they were parents) are also quite welcome most anywhere. While the area we were sitting in was occupied by people having a drink or two, children were also present and enjoying their own beverages. It’s just not a big deal, in Greece. Check it out! 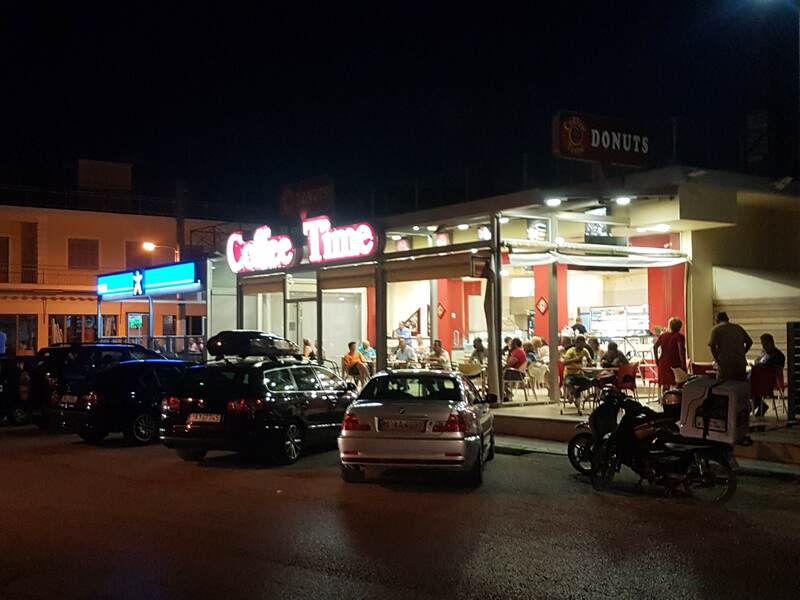 We were driving through the town at night, and I happened to see Coffee Time! We didn’t stop so I’m not sure if their coffee and donuts are the same as in the Canadian franchise coffee shops, but I was surprised to see this in Artemida, Greece. Okay, it wasn’t just for the almond harvest, but that sure was a memorable part of the experience. But first, a bit about Exarchos. I’d heard of it many times before but had never visited – my partner’s family have a house in the village along with some lands in which they harvest almonds, a vineyard, and olive trees. 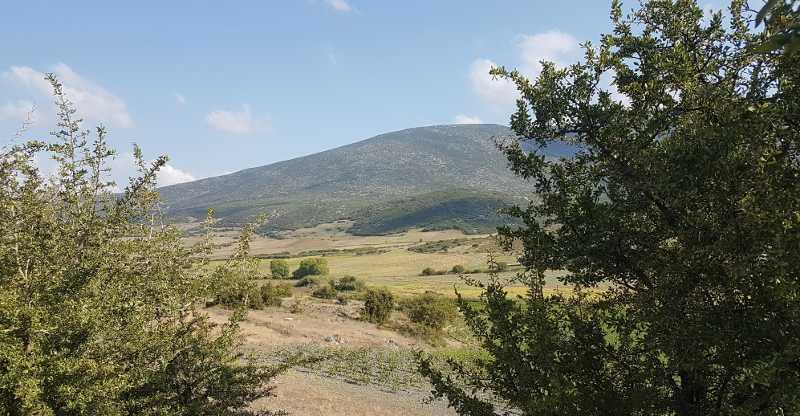 Exarchos is located west of Atalanti and is about a 2 hour drive from “spiti mas” near Athens. Most of the drive can be done along a National Highway, but the tolls are high. Taking non-toll routes can make the journey significantly longer and involves driving some rougher roads. We wanted to get there fairly quickly, so we bit the bullet and paid the tolls. But that’s for another blog post – the amazing similarities I observed (except for the language of course), between the Greeks and the Irish. For now, we’ll continue with the drive to Exarchos. Along the route, you can view a lake, that at first, looks quite small. Unlike Ontario and other parts of Canada, lakes seem to be quite rare in Greece. There is of course, the sea… but you just don’t come across lakes like we do here. The name of the lake is “Limni Iliki” or Lake Yliki and has an area of 19.1 km2although at first, you wouldn’t realize it to be that large as you view it on the right hand side going north on E75. After the nice driving break, we moved on but took a little detour into the town of Skala, a small seaside town near the entrance of “Kolpos Atalantis” (Bay of Atalantis). Once there, we found a place to park and walked along the shore, admiring the view of the sea and the mountains on the island of Atalantonisi (I believe). Skala is a pretty little village and we walked a bit, but did not stay long. There was one sad observation – as we walked along the street, we noticed a crowd had gathered and an ambulance parked nearby. As we approached, it was obvious that paramedics were performing CPR on a woman laying on the ground. It did not look good – people had obviously been there for sometime. We continued walking past the crowd, and when we returned, we could tell that CPR was continuing. We don’t know whatever the end result was but it was a solemn moment and we wish and hope the efforts of the paramedics were successful. 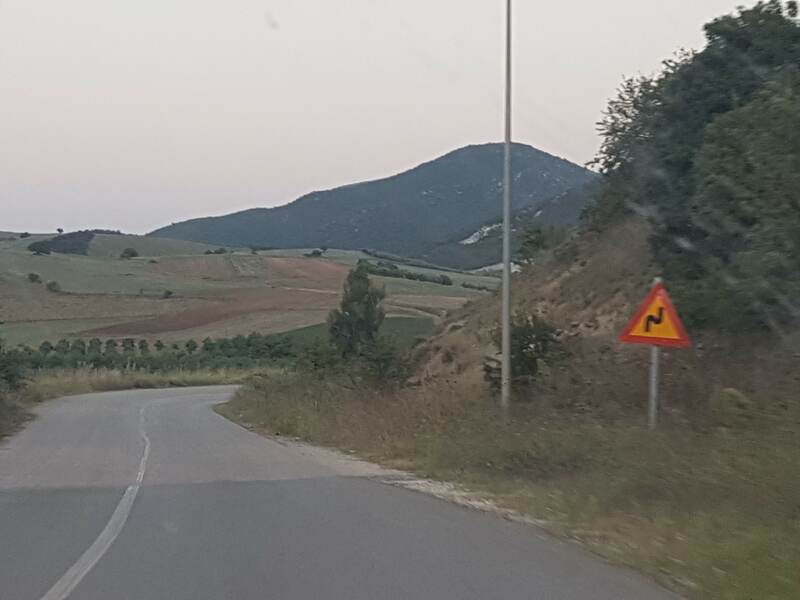 As we drove from Skala to Exarchos, we went through a small town (although the second largest in Phthiotis) called Atalanti. While Exarchos has a “general store” where you can purchase groceries, household items and also has well-stocked shelves of wine, beer and liquor (including whiskey, the ubiquitous to Greece tsipouro, and other spirits), if you’re in Exarchos and needed something more specialized – like say a pet dog harness – you’d head to Atalanti, about 20 km away. Actually, you can get a lot more than dog harnesses in Atalanti, but at one point, we did need to get a dog harness and finding the right pet store involved asking a lot of people for directions. That seems to be a common activity in Greece when you are driving and trying to get to a place or a road you don’t know. You ask for directions; everyone tries to be helpful – but often the first set of directions are not the best. So you head off in the direction you were first told, and then stop to ask for new directions. This can happen several times before you finally end up where you wanted to be and first asked about! Driving out of Atlanti puts you on a road that is not dissimilar to some very rural Ontario paved roads. However, the turn to the actual road that takes you to the village is more like a road in Ireland – narrow and bendy. The scenery was gorgeous, but unfortunately most of the photos I took did not turn out well; they were out of focus as we drove and the daylight was beginning to recede. Along the road to Exarchos. When we arrived in the village, the road became even narrower and in places, there was barely enough room for one car to travel let alone two going in opposite directions. But this is not abnormal for old Greek villages – and in fact, it’s also the norm in many parts of Athens and the suburbs. When driving, you must pay attention – and often, you are estimating centimeters of space on either side of your vehicle. 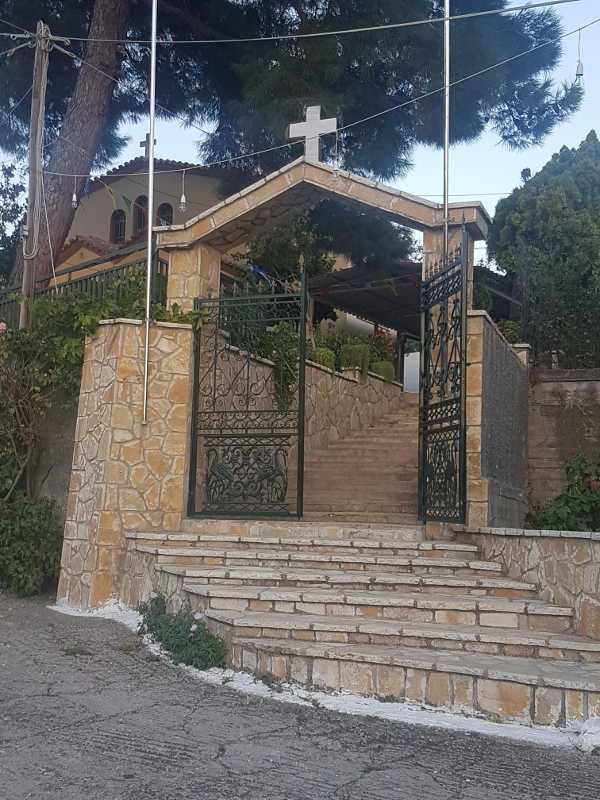 There was a lot of nervousness on my part as we approached the village – here I am, hardly able to speak a few words in Greek, going to spend time with “mom and dad” who don’t know English, and of course, it’s also a small village where nothing goes unnoticed. I didn’t need to fear. The first evening in the village was awesome! Where we could not communicate in verbal words, we managed to communicate with smiles, gestures, and of course, with the great patience of my partner in translating when necessary. I was immediately made to feel “at home,” and enjoyed home cooked dinner by “mom” that was delicious. Mutton was on the menu – local I might add, and was cooked perfectly! Again, another comparison to Ireland as I can remember mutton – Irish stew – on the menu there. After dinner, we sat outside for some hours enjoying the warmth of the evening, enjoying some laughs, and the fellowship of each other’s company. But then…. I heard a dreaded thing! “Six thirty AM, Ian.” What?? Oh my gosh – it’s been a long time since I’ve seen 6:30AM unless it’s because I have not yet been to bed. I’m just not an “early riser” and tend to be a “late worker.” But okay, let’s make the best of this, and while I worried if I was going to have a bout of insomnia, I somehow miraculously managed to fall asleep and actually felt fresh when the alarm went off in the morning. There is a very good reason for getting up early in the morning in Greece when you have hard work to do in the summer, outside: the heat. While night time heat often does not decrease a lot in the summer, it is still cooler at 9 or 10 am than it is at 1PM under the blazing sun. So you get up early to get your work done – or as much as you can – before the afternoon begins. Monday morning started off with lots of “Kalimeri!” and “Everything good?” along with thumbs ups over coffee. Then, making sure I had the right clothes for the fields along with making sure some snacks and lots of water was packed. We drove as far as we could along paths… probably originally Shepherds paths, that were never intended to see a Mazda’s wheels upon the surface. Herding sheep on foot is fine, though. When we got as far as we could in the car, we parked it and clambered into an old small Japanese pickup truck and slowly made the rest of the way to the almond tree field. Then, work began in earnest. Let me tell you. Harvesting almonds is not an easy job. Harvesting almonds on a field that is sloped is hard work. While it’s probably that some almond farmers have other methods, like powered tree shakers, that’s for large scale almond harvesting – and we had none of that. Instead, we had a long (about 9′ – perhaps 3 metres long) 2″ X 1/2″ “stick” and some other rods… it requires accuracy like playing pool, and strength but a gentleness at the same time, to knock almonds out of the higher branches of the trees. And yeah… I was the tallest person there! Hours of holding this stick… looking for almonds, trying to shake them loose while looking up and the sun is starting to blaze, is no easy job. Then, there are times the trees are so tall, and the almonds are high, that you have to climb the trees as well. But you know what? I loved it! I used to love working outdoors on farms here in Ontario and a ranch in Alberta – and it was so nice to be out doing that kind of work, where you know you are going to be physically exhausted, but you can see the accomplishment. And the four of us out there together, with the same goal to get every darned almond we could from the trees – even though three of us could not understand each other verbally, we could understand each other in other ways. No almond would be left behind! We ended our almond harvesting on that Monday, early in the afternoon after all of us vigorously harvested every almond from a particularly tall tree. We spent probably, well over an hour on that one tree, which had prolific almond nut growth. We climbed it, we figured out angles, we traded time with the big stick, and got them all. From the highest branches. After several inspections of the tree and assurances we had got them all, and with achy muscles, sweat pouring down, sore hands with blisters forming, we called it a day. Water was chugged back and we drove back to the village, knowing that while it was hard work, we accomplished lots, and we did it with a big language difference. Yet we understood each other. Isn’t that beautiful? I sure think so, and can’t wait to go back! I also had my first experience eating fresh figs! When mom found out I had never had a fresh fig in my life, she went out and got one from the tree behind the house, showed me how to peel it, and it was amazing! So tasty – nothing like the dried ones – although I still will like them if I cannot get fresh. Monday afternoon was really nice for a number of reasons including my first fresh fig, and walking around the village. And later, more amazing home-cooked Greek food! Some Greek beer, a little wine, and more good company – but Tuesday morning was coming fast, and again, another 6:30 AM start. It started out like the day before, and in fact, most of the morning harvesting almonds was not that much different. But there was a bit more heaviness to the day, for we lost Jerry! I first met Jerry in Greece, back in either late September or early October of 2017. Jerry is a funny name for a Greek, right? Yes – but Jerry is a dog. If you recall, I mentioned Atalanti for finding a dog harness. It was for Jerry. Jerry is an interesting dog, and I’m not even sure what breed he is, but he is relatively small, although larger than my Boston Terrier. He has a curved up tail, and has a mouth that shows his teeth when he “smiles.” He also shows his teeth when he’s not smiling, and is a bit angry. Anyways, Jerry was in the village while we were there, and for some reason, on Tuesday morning, he made up his mind that he was going to follow that old white pickup truck. We tried to “shew” him back many times, and even stopped to try to get him into the truck, but Jerry has a mind of his own. Which is probably a good thing, in some ways…. At the outskirts of the village, Jerry appeared to stop following us, and we all thought he must have returned home. But he did not. Tuesday was a tough day for us all, and although we did manage to harvest a good amount from almond trees, it was not quite the same as the day before. “Where is Jerry?” “Where could he be?” was a constant question on Tuesday … and as Tuesday evening arrived… and then Wednesday morning… and no sign of Jerry, our thoughts went to the worst. We searched, we walked, we called, we whistled… we went over the same routes and different ones, many times. Most of the villagers had sobering thoughts about the possibilities of Jerry surviving on his own. Jerry wasn’t uknown to pick fights, either – but dogs in this neighbourhood were a little more savvy and bigger, then Jerry. Water and food would be hard to come by, no matter what, if you’re a lost dog and not being looked after. But for now, we’re up to the end of my first week in Greece, summer 2108. My partner and I had though that Exarchos would be a great “base” for visiting some other areas, after we had helped out with almonds.